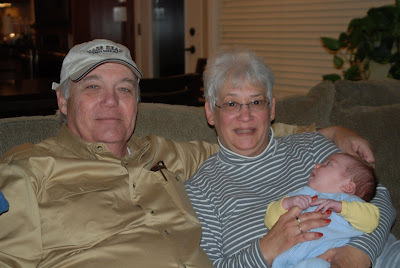 The Ward Family: Grandma Judy and Grandfather John Have Arrived! YEAH, they are here! Grandma Judy and Grandfather John arrived last night around 8pm. They decided to drive from Maryland this time so they could make a few stops along the way. It was a very long drive for them...some 16 1/2 hours...but what a present at the end of that long drive...Grandchild #6. Brody makes grandson #3, so now we have an even split!! Brody was very intrigued by Grandma Judy's grey and white stripped shirt. As you see here in this photo he can't take his eyes off of it! We are so excited to have them here, not to mention I'm going to get out of the house for a massage AND a much needed hair appt...I'm so excited! PS Brody's middle name (Malcolm) is Grandfather John's middle name as well!